Salt water chlorinator systems for pools are all the rage these days. And with all the positives that users get to look forward to, it is not so hard to see why. The most important part of the salt chlorinator is the salt cell. This is what is responsible for producing the chlorine from the salt dissolved in the pool. As with most good things in life, the cell plates require periodic maintenance to prolong their life. This article discusses the merits of cleaning a salt cell with muriatic acid. Salt cells in chlorinators are exposed to a lot of elements and minerals as the water passes over and through the unit. Over time, these minerals can build up on the cell plates, mostly calcium, and will negatively affect the overall performance of the chlorinator. Most manufacturers will recommend periodic inspection and cleaning every 3 months. It is important to note that cleaning the mineral deposit off the plates with a hard device is certainly NOT recommended due to the damage it can cause to the chlorinator plates. Cleaning salt cell with muriatic acid is one of the best ways to clean the minerals built up on the cell plates. It has the same chemical composition as hydrochloric acid but contains extra compounds. These make it great as a sanitization compound as it targets both the minerals and other organic and living matter in the cell. Below are a few simple steps to follow when using muriatic acid to clean your salt cell. 1. STEP 1 – Switch of the system and remove the salt cell; check your manufacturer’s instructions on how to do this specifcally for your type of chlorinator. 2. STEP 2 – Suit up with protective gear including cover-alls, gloves and goggles. 3. STEP 3 – Add muriatic acid to water in the ratio of 1 part acid for every 5 parts of water. 4. STEP 4 – Soak the cell in the mixture for 10-15 minutes then rinse off using a high pressure hose. 5. STEP 5 – Inspect the salt cell’s plates. If there are deposits still visible, repeat the process. If there aren’t any, reinstall the unit and start the system. As earlier stated, muriatic acid has a lot in common with hydrochloric acid. However, it is the better option by far when it comes to salt cell cleaning and other sanitization practices. Below are four reasons why. 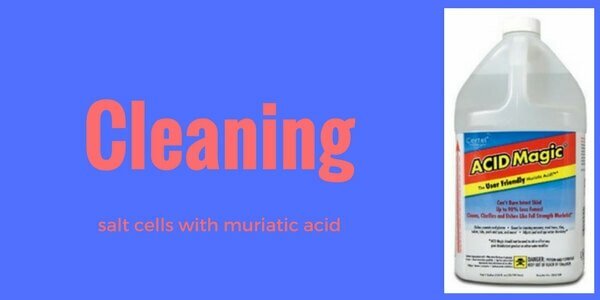 Muriatic acid is enriched with extra compounds for activity against microbes and not just accumulated minerals. It is more diluted than hydrochloric acid and will not cause metal erosion in the process of salt cell cleaning. Muriatic acid is safer and less irritating to work with than hydrochloric acid. Muriatic acid is also less reactive with water. However, you should still mix by adding acid to water and not the other way round. After all is said and done, there is no denying the fact that cleaning a salt cell with muriatic acid is exactly what your salt water chlorinator needs. It is important to remember that you need to carry out maintenance like this on a regular basis. With salt cells in particular, you should clean at least once a season or as recommended by the manufacturer. So whether it is for your home pool or high end spa, the tips and guidelines above should help keep your system clean and functioning optimum for convenience and longevity. Please note that this article is a general recommendation and may not apply to all types of salt water chlorinators. Please consult with your manufacturer’s instructions prior to carrying out any cleaning with a solution such as muriatic acid.